Posted on May 13, 2016, by & filed under Beyond Zionism, General, Personal Experiences, Study Tour Reports. Under the 1947 UN Partition Plan, Tel Aviv was assigned to the new Jewish state, while Jaffa was to be part of the Arab state. In the war that followed, Jaffa eventually fell to the Jewish militias, and the Palestinians fled to refugee camps in places like Qalqilya in the West Bank. Arab Jaffa was absorbed into Israel, and in 1950 the two cities were merged and renamed Tel Aviv-Yafo. In Tel Aviv-Yafo we met with Umar al-Ghubari of Zochrot, an Israeli NGO which, in its own words, has been fairly successful over the past few years in raising the Nakba to the awareness of the broad Jewish public. The destruction of hundreds of villages and resulting hundreds of thousands of Palestinian refugees in the 1948 War have become part and parcel of current Israeli discourse; nevertheless, its mere presence in Jewish Israeli discourse still does not mean broad acknowledgement of and accountability for the Nakba. This gap is largely due to the continued adherence of Jewish Israeli society to colonial concepts and practices. Its aim is to bring about a reconciliation between Israelis and Palestinians through peaceful means, particularly through confronting historical reality pared of all rhetoric: Zochrot envisions Return as an extended and multidimensional process, which includes not only the physical return of refugees to this country, but also their appropriate and dignified integration in an equal, joint Palestinian-Jewish society. Umar pointed out the building of the Peres Centre for Peace, founded in 1996 by former Israeli President Shimon Peres, with the declared aim of ‘fostering tolerance’ between the two communities, and constructed in the Arab area of Ajami. It was, said Umar, a complete farce. Instead of being openly available for both Jews and Palestinians, the latter were shipped away to a fenced-in ‘community’, as seen in the film Ajami. The European Union contributed 1 million euros for its opening ceremony: now the building is largely empty. Zochrot means ‘remembering’ in Hebrew, and its primary purpose is to keep the historical realities in the forefront of public consciousness. Only when these truths are acknowledged can reconciliation begin. In Israel proper, Umar said, there are 1.3 million Palestinian citizens, plus an extra 300,000 in East Jerusalem and more in the Golan Heights. East Jerusalem and Golan were both annexed after 1967. Palestinians became a minority in the State of Israel after the violence of 1948, when many either fled or were expelled and were forbidden to return. Zochrot wants to put the events of 1948 on the centre of the table in discussions, because it holds that the current injustices began then, whereas most peace organisations see the 1967 Occupation as the origin of the problem. Any negotiations that consider 1967 to be the starting point are doomed to failure. Zochrot was established in 2002, mainly by Jewish-Israeli activists, whose aim was to raise the awareness of Israelis, who are uninformed on the matter, apart from seeing it from the viewpoint of the ‘independence struggle’. Zochrot invited some Israelis to accompany them to one particular village and see what had happened to it. The original inhabitants were also invited along. The Arabs took with them signs with the names of the original village, and pointed out the site of the original church, the mosque and the houses of the principal families. The Israelis were made aware that people expelled after the war had ended were not allowed to return. The newly established Israeli government, in January 1948, gave orders to the army to shoot any Palestinian who tried to re-enter (see the movie When I Saw You). They erased 600 towns and built new towns on top of them. Their excuse was: ‘This is absentee property’. The villagers of Al-Shayk Muwannis, for example, were forced out by Jewish militia in 1948, and Tel Aviv University was built on the ruins of their houses. (‘Today you will find the elegant buildings of Tel-Aviv University sprawling over the ruins of this village, while one of the village’s few remaining houses has become the university’s faculty club’: Ilan Pappe, The Ethnic Cleansing of Palestine, 2006, p.103). The Nakba also fractured the economic and cultural life of people who’d lived in Jaffa for hundreds of years, said Umar. If you ask Israelis, ‘Do you want to have ethnic cleansing in Palestine?’ most will say, ‘No; you started the war.’ There is much evidence, though, that the Zionist leaders of the time wanted Palestinians removed from Palestine entirely. They believed that without the Nakba there could be no Jewish state. So, for justice to be achieved, the Nakba must be the basis. And how can the 7 million Palestinian refugees be accommodated? Zochrot has tried, in workshops involving Israelis and Palestinians together, to find out how this return might be possible. How can you reconstruct a Palestinian village when an Israeli town has been built over the top of it? These workshops focus on ‘Ideas for Practical Return’. You can’t destroy hotels and tall buildings in order to restore a Palestinian village. Perhaps the returnees could live in a nearby area, or in a place of their choice? Thousands of Palestinian houses still exist in Israel, lived in by Jewish families. The Israeli government’s dream of a ‘Jewish state’ would not be viable if it had to include non-Jewish citizens. Racism and justice cannot cohabit. The new state would have to give equality to all its citizens. Zochrot has taken study tours involving both Palestinian Israelis and Jewish Israelis to Yugoslavia, South Africa and Northern Ireland, to see how those countries have coped with their own divided societies. Zochrot also has an educational department, working with Israeli educators to address the issue of how to teach what happened in the creation of Israel. The visible evidence of recent ruins is all around, but most Jews don’t want to see it. The NGO also puts on exhibitions three or four times a year in its gallery. It publishes books and has produced an app, iNakba, which gives directions to destroyed Palestinian villages. In March 2016 Zochrot will hold its 3rd conference on the Right of Return – at Tel Aviv University. At this conference 50 per cent of the papers presented will be from foreign universities and 50 per cent from Israeli universities. Zochrot receives funding from European organisations such as Christian Aid. UK Quakers are supporting the conference. Jaffa itself, said Umar, was established 6,000 years ago. Under the Ottomans, accommodation for Jewish pilgrims en route to the holy cities of Jerusalem, Hebron, Tiberias and Safed was provided in a part of Jaffa that became known as Dar el-Yehud (‘home of the Jews’). 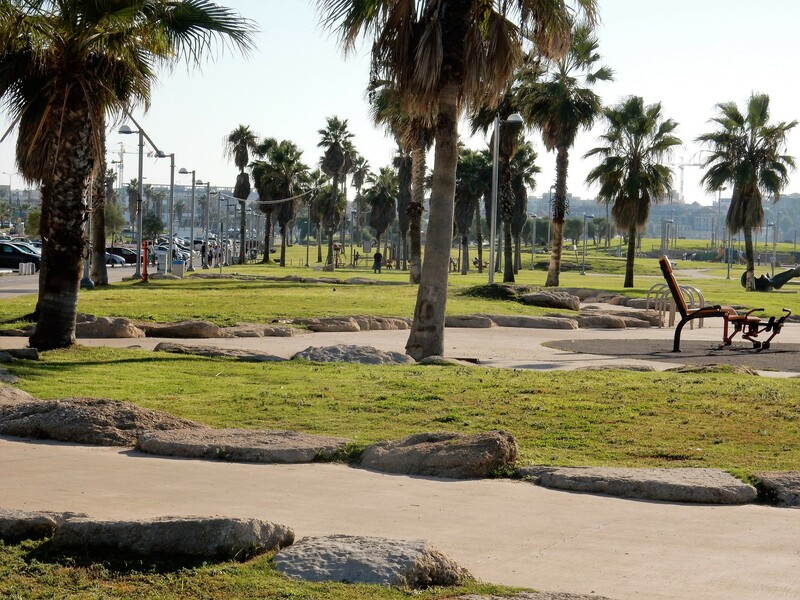 The Zionists decided to develop the neighbourhood of Tel Aviv, where most Jews resided, and in 1935 the British mandatory powers granted it municipal status. In April 1948 the Irgun militia attacked the Jaffa neighbourhood. Jaffa had been assigned to the Arab state by the United Nations, but the pre-emptive attack on Jaffa, one month before the State of Israel was declared, put paid to that. The militia, favoured by much superior armaments, took the area house by house. 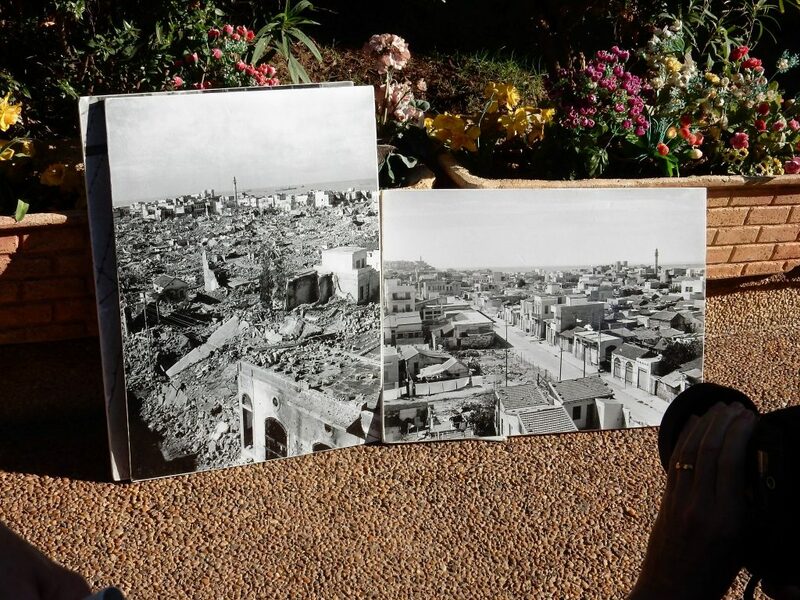 – Photos of al-Manshiyya before the Nakba (on the right) and after the 1948 bombardment by Jewish militia (on the left). These photos are unlikely to be displayed in Israeli museums. Before the State of Israel had even been declared, 40 per cent of the villages of Palestine had been destroyed, as had most of the important Palestinian cities: all part of a plan that had been in gestation since well before the Second World War: a plan to wipe out any possibility of an Arab state in the ‘Land of Israel’. In the 1960s the Israeli government decided to beautify the area around Jaffa’s Old Mosque, and they moved out the working-class Jewish families who were living there. The question arose as to what to do with the mosque. Some voices were raised in favour of demolishing it; in the end it was decided to keep it, but to forbid its use as a mosque. In the 1990s, however, it was reopened as a mosque, and fulfils that function today. Having finished his discourse, Umar then led us on a walk along the seafront of Tel Aviv-Yafo. 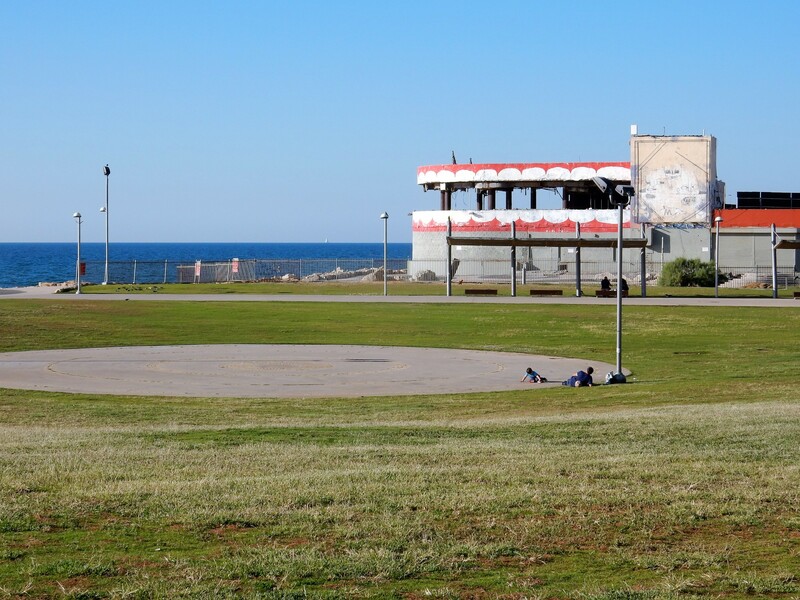 One of the first sights to meet us was the bombed-out remains of the Dolphinarium discotheque, where a Palestinian suicide bomber blew himself up, killing 25 people, most of them teenagers, in 2001: a stark reminder that acts of violence were not the province of one side only. An artist had alleviated some of the grimness by painting teeth and gums on the structure. – The Dolphinarium discotheque, blown up by a Palestinian suicide bomber in 2001. Further along the promenade we came upon a memorial to the ‘Liberators of Jaffa’. 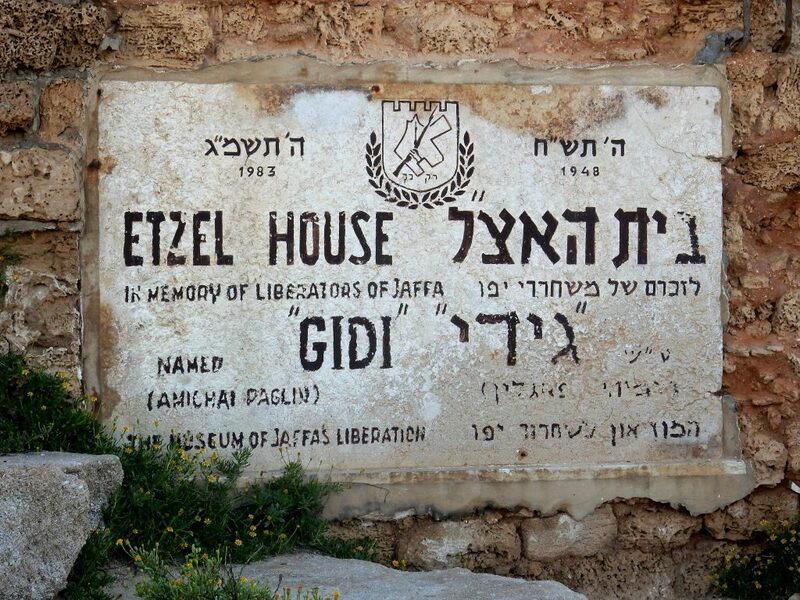 This is on the outside wall of the Etzel House Museum, and marks the spot from where the Etzel (later called ‘Irgun’) militia, led by Menachem Begin, drove the Arabs out of Jaffa. The motto in Hebrew, at the top of the plaque, means ‘Only this way’, and it is noticeable that the map of Eretz Israel (‘The Land of Israel’) that it incorporates seems to include the Kingdom of Jordan. Today Jaffa is home to 20,000 Palestinians and 80,000 Jews. The Palestinians are under mounting economic pressure to leave. – The memorial to the ‘liberators of Jaffa’ on the Tel Aviv seafront. Having said farewell to Umar, we continued along the seafront to where the bus was waiting. Looking at the people larking about on the beach, I was struck by the air of normality that the scene seemed to express. You might almost think yourself at an English seaside resort on a summer’s afternoon (Weston-super-Mare came to mind). This led to a reflection on the disjunction between appearance and reality. Jaffa was like a palimpsest: one layer of history covered a previous layer with vestiges of the latter poking through here and there. Rather like Rome, with classical, Renaissance and baroque traces jockeying for attention against more modern architecture. The only difference would be that in Rome the clutter of bygone eras was manifest for all to see. In Jaffa, except for the Old Mosque, it had been all but obliterated. In the evening we took our supper at the Shepherds’ Valley Restaurant in Beit Sahour: delectable Arabian cuisine in a huge Bedouin-style tent, accompanied by Palestinian song and dance. Most fortifying, and most welcome. Tomorrow to fresh woods, but for the time being it was good to be dining in a place where Palestinians seemed free to enjoy themselves. For more information about the Nakba you might be interested to see this AlJazeera series ‘The Nakba debates‘ featuring Rosemary Hollis, former head of the Middle East programme at the Royal Insitute of International Affairs; James Renton, senior lecturer in History at Edge Hill University and author of The Zionist Masquerade: The birth of the Anglo-Zionist alliance 1914-1918 ; and ICAHD UK patron Avi Shlaim, a professor of International Relations at Oxford University and author of the Collusion across the Jordan: King Abdullah, The Zionist Movement, and the Partition Of Palestine. Or PSC’s handy fact sheet here. – With thanks to John G for his reflections.